In sensitive company it may be advisable to a void over-emphasising the first part (appropriately descriptive of the stems if not the flowers) of the common name of this wonderful wild geranium! Up to 40cm in height and spreading, with branched stems, Bloody Cranesbill is a bushy perennial with long-stalked deeply divided palmate leaves each with five to seven bi-lobed or tri-lobed lanceolate leaflets that are hairy on the undersides. Deep magenta veined with purple, the flowers have five overlapping unnotched petals and are 2.5 to 3.5cm across, usually opening out almost entirely flat. The bristly flower stalks and seed capsules turn bright red, and in dry locations the leaves also take on a lovely red tinge in the autumn. Geranium sanguineum is localised in Britain, mainly in coastal habitats but also in some inland areas of limestone pavement. In Ireland the Burren in County Clare is a very good place for seeing Bloody Cranesbill growing wild; elsewhere it is more likely to be a recent garden escape. 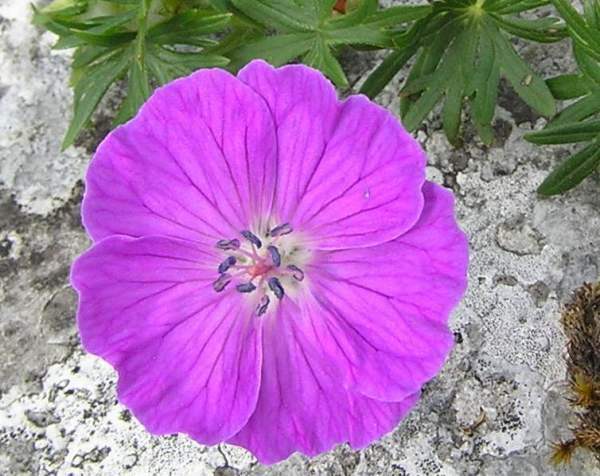 On mainland Europe Bloody Cranesbill is found in low-nutrient alkaline grassland from southern Finland down through central Europe (the species is well represented in Slovenia, for example) to the Mediterranean and into northern Africa. Its range extends eastwards into parts of western Asia. 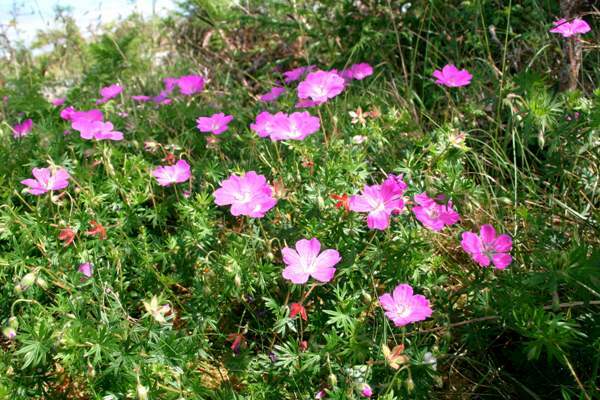 Bloody Cranesbill grows in coastal sand dunes, where the broken sea shells raise the alkalinity even in areas where the soil inland is acidic. This plant is also found on some inland areas of chalk downland and thrives in the grikes of limestone pavement at such notable sites as the Burren in Ireland, on the Great Orme at Llandudno in Wales, andon the limestone pavement in Lancashire and Derbyshire. A good place to visit in Lancashire to see this flower and many other interesting species is Gait Barrows National Nature Reserve. Near towns and villages escapes (or throw-outs, more often) of garden cultivars sometimes create impressive colonies on roadside banks. 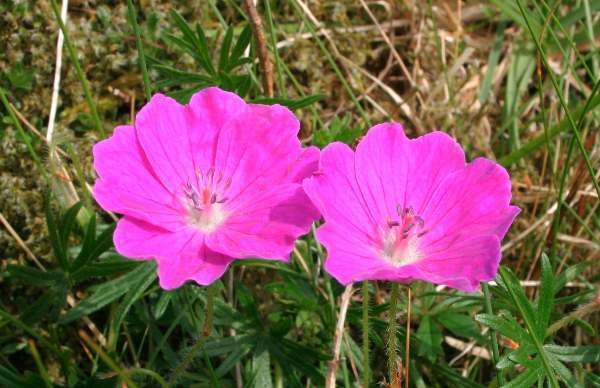 In Britain and Ireland Bloody Cranesbill can usually be seen in bloom from May until August. Probably introduced to Britain (and most of western Europe) from the eastern Mediterranean in the distant past, Bloody Cranesbill has since been cCultivated as an ornamental plant for parks and gardens. This plant is reputed to have been used as an astringent, with nose bleeds and even battle wounds benefitting from poultices made from the leaves. Many magical powers have also been claimed for wild geraniums, but the antiviral properties of extracts from Geranium sanguineum are real rather than imagined, and they have been the subject of scientific research in recent times. Geranium, the genus name, comes from the Greek noun geranos, meaning Crane (birds of the group of species known as the Gruidae). It is a reference to the beak-like fruit (seed capsule) which is reminiscent of the long beak of a Crane. Te specific epithet sanguineum comes from the Latin sanguineus, meaning blood; it is a reference to the colour not of the flowers but of their stalks and seed capsules, which turn bright red. The flowers do change colour as they age, however, but rather than redenning they turn a deep puplish blue after three or four days. The Bloody Cranesbill plants shown on this page were photographed in The Burren in June.